You’ve decided to pop the question and take the first step to spending the rest of your life together. We have some invaluable advice for choosing that special ring – even if you’re planning a surprise proposal. Let’s start with the basics: The engagement ring always sits on the third finger (next to the little finger) of the left hand. Guessing your partner’s ring size correctly can be done with a little common sense. If you have a petite partner or they are under 160cm tall, it’s likely that her hands are smaller with slender fingers, so try starting at a size H or I. If they’re closer to 168cm, chances are she has the average finger size L½. Finally, if your partner is above average height or build, her weight will be naturally distributed across her whole body, so it might be a good idea to start at around a ring size N.
If asking out-right isn’t an option, you could ask your partner’s family and friends for help because they may be able to offer their advice. You could even ask her friends to suggest going out to try on rings and have their finger size measured while there. There are other options like having a ring she already wears on her left-hand ring finger discreetly measured. However, if the ring is wider or narrower than 2mm, the more likely it is that the ring size won’t be entirely accurate, but it will be a rough indication. 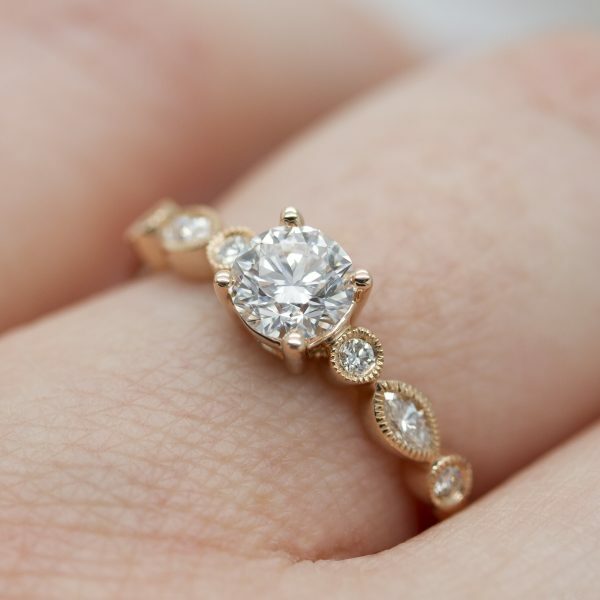 Around 40% of rings end up being resized, so as long as you can get a rough estimate by following these basic ring size guidelines, you’ll get a pretty close idea. If you don’t manage to find the right ring size, we offer a complimentary first re-size on most designs to make things nice and simple. 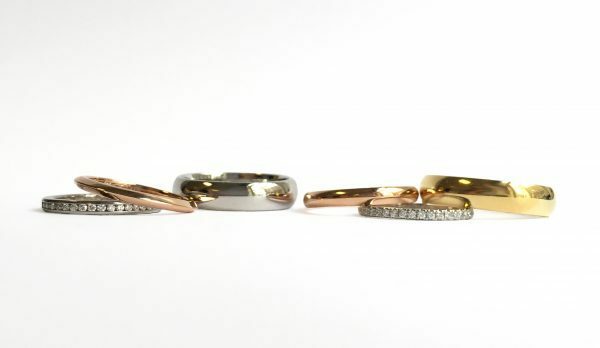 If the ring needs to be re-sized any more than two sizes larger or smaller, there may be a fee that you must pay as your ring may have to be re-made. 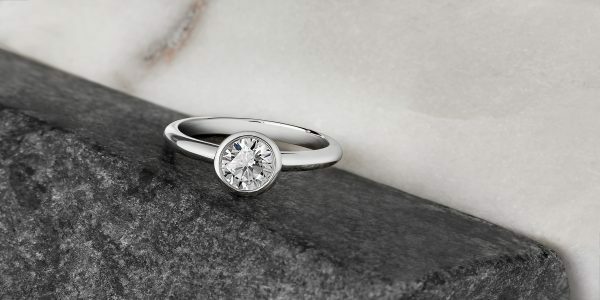 To resize your ring, we make a small incision in the band and extend or tighten it as required. Once that’s completed, the gap is soldered and polished to seamlessly hide any evidence of alterations. You can download our free printable ring sizer below. We estimate Adele’s ring finger size to be an O. We think that Eva Longoria’s ring size is around an I. We estimate Kate Winslet’s ring finger size to be the national average of around L½. Taylor Swift’s ring finger size would be around a size K.
We think Serena William’s ring size would be around an O. We would estimate that Rihanna’s ring size is around average, like Kate Winslet’s at a size L½. We would estimate Rebel Wilson’s ring size to be an S.
We think Jennifer Lawrence’s ring finger size could be a K½. Kim Kardashian’s ring size would be around a size J. So you see, with a little common sense, you can guess you or your partner’s finger size as close as possible. 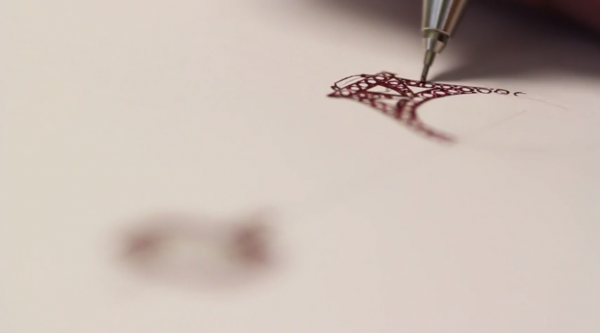 At Taylor & Hart, we realise how important it is to get the perfect fit on your ring. 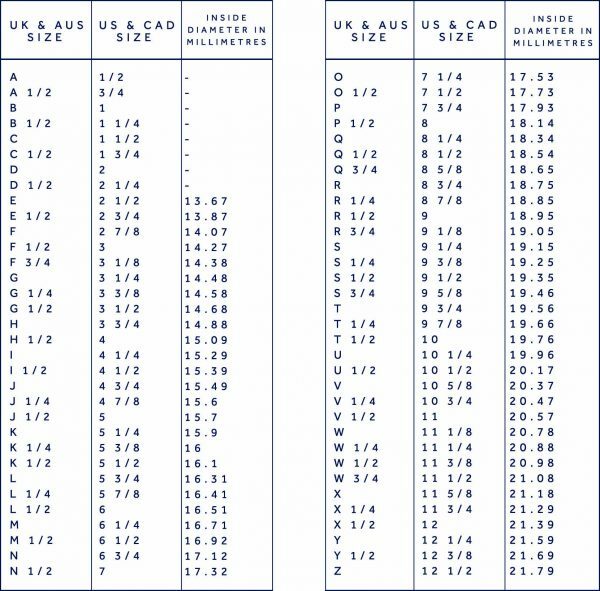 Some jewellers use the US sizing system, while others opt for the UK. It’s easy to convert your US ring size into UK ring size and vice versa. Simply use the ring size conversion chart below to obtain your ring size. US and UK ring size converter.